"The conscious and intelligent manipulation of the organized habits and opinions of the masses is an important element in democratic society. Those who manipulate this unseen mechanism of society constitute an invisible government which is the true ruling power of our country. "-Edward BernaysA seminal and controversial figure in the history of political thought and public relations, Edward Bernays pioneered the scientific technique of shaping and manipulating public opinion, which he famously dubbed the "engineering of consent." During World War I, he was an integral part of the US Committee on Public Information, or CPI, a powerful propaganda apparatus that was mobilized to package, advertise, and sell the war to the American people as one that would "Make the World Safe for Democracy." The CPI became the blueprint for the marketing strategies of future wars.Bernays applied the techniques he had learned in the CPI and, incorporating some of the ideas of Walter Lipmann, became an outspoken proponent of propaganda as a tool for democratic and corporate manipulation of the population. 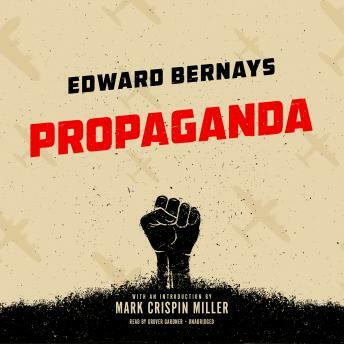 His 1928 bombshell, Propaganda, lays out his eerily prescient vision for using propaganda to regiment the collective mind in a variety of areas, including government, politics, art, science, and education. To read this book today is to frightfully comprehend what our contemporary institutions of government and business have become in regard to the organized manipulation of the masses.